Do you ever wonder how Santa always finds the perfect gifts every year? 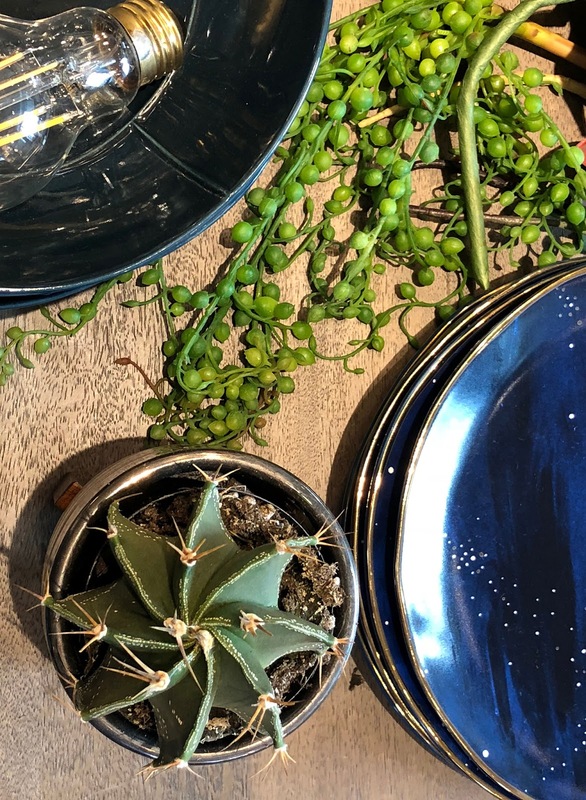 I'm convinced that he must shop at Downtown Summerlin, because I found quite a few things to add to my wishlist during an awesome event with some of Las Vegas' top bloggers that was hosted by the fabulous Christie Moeller! 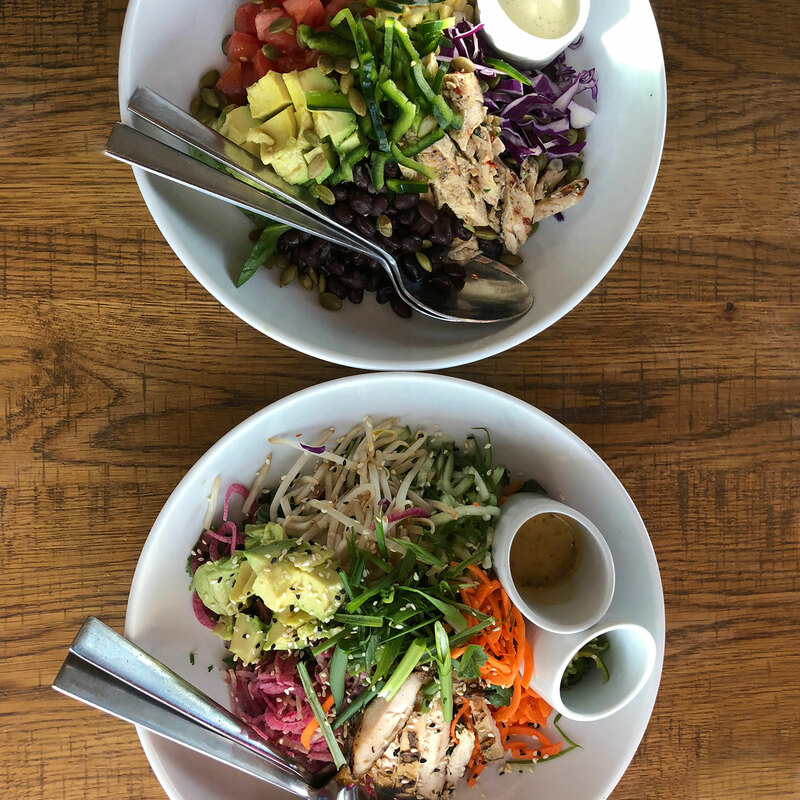 Hit the jump to check out all the awesome stops on our Downtown Summerlin journey, and to see some of my picks (and purchases!) for gifts this year! Which list are you on this year? Is your name lovingly scribed on Santa's 'Good' list this year, or scribbled hastily, but firmly, in ink on that feared 'Naughty' list? 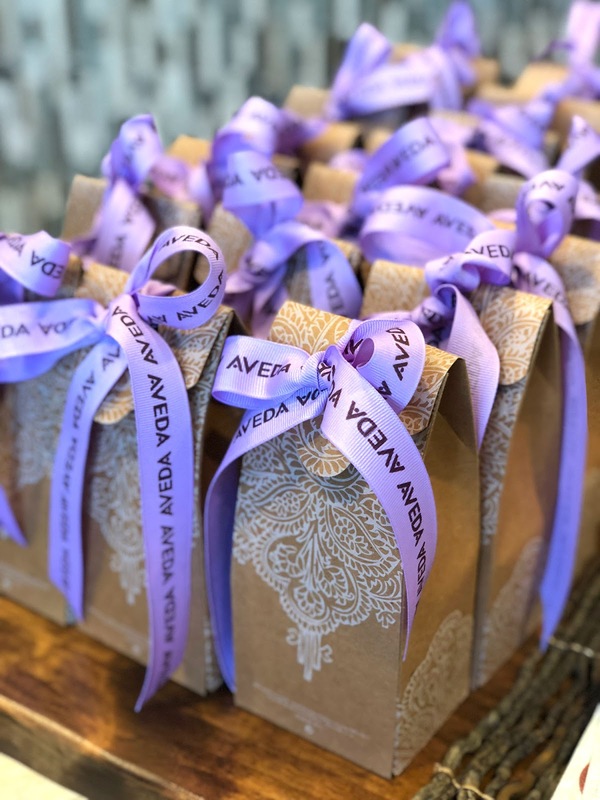 No matter which list you're on, your perfect gift can be found at the stores at Downtown Summerlin. 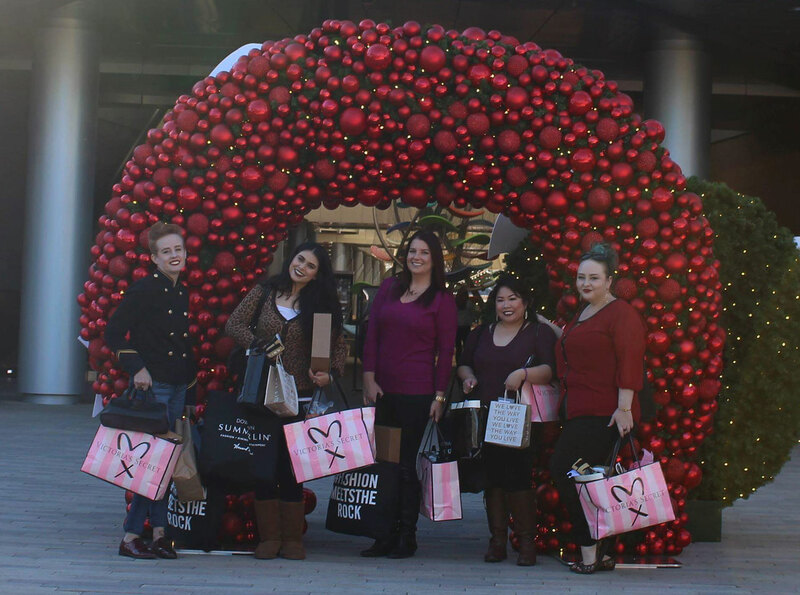 We made stops at Dillard's for Jo Malone; Oil & Vinegar to spark our tastebuds; Leather Couture, a store featuring amazing handmade leather pieces; the G Aveda salon, which is the perfect spot to erase all the stresses of the holidays; and CPK to replenish all those calories we shopped off! 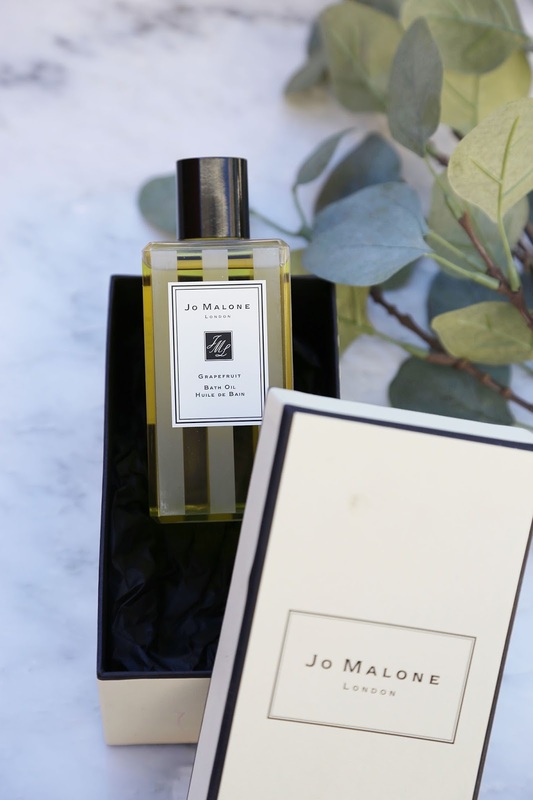 Now I know I've mentioned Jo Malone before, but despite learning about the brand in the past, I learned even more from Anthony Vesnaver, Jo Malone's Executive Director of Education for North America. 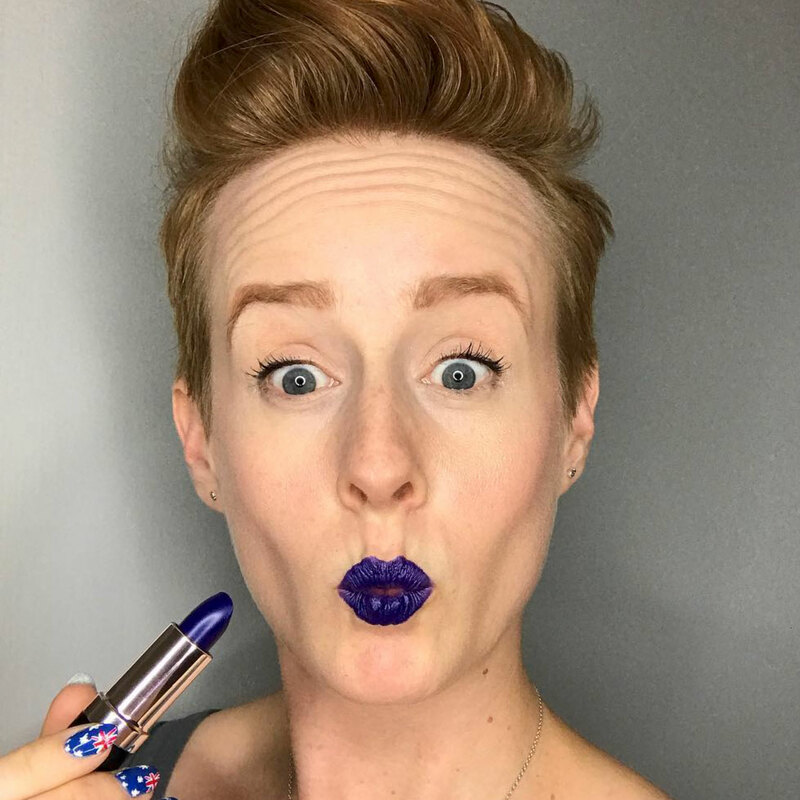 Anthony taught us about the origins of the brand, techniques for using and layering their fragrances, scrubs, and cremes. Fun fact: The official scent of the wedding of Prince William and Kate Middleton was their Orange Blossom fragrance (which smells divine, btw) - they burned candles all throughout the church...I can only imagine how amazing that smelled. Plus, since scent is the strongest way to evoke a memory, Kate can transport herself back to her wedding day with a simple spritz, anytime she wants to! I totally love that idea, and would definitely do something similar if I ever get married! I wonder if Prince Harry and Meghan Markle will do something similar for their wedding?! Need a break from shopping? 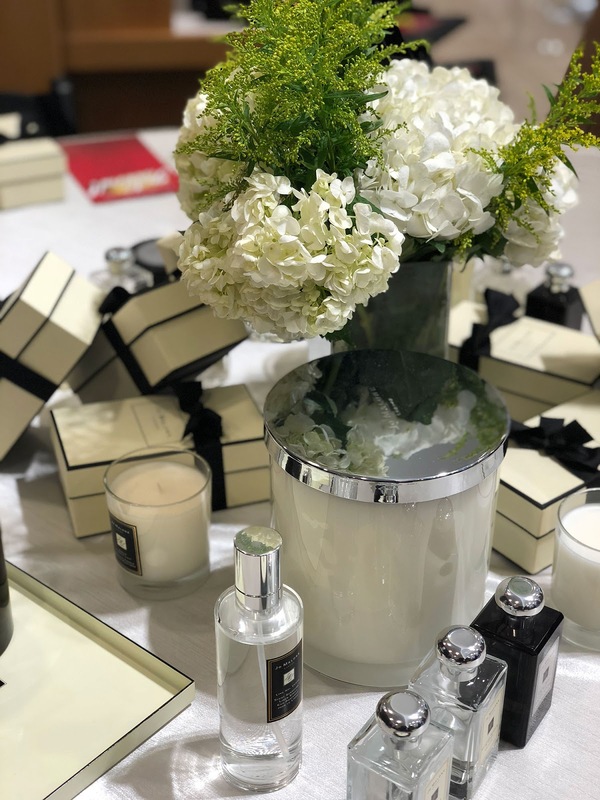 Drop by the Jo Malone counter at Dillard's for a soothing hand massage! They use hot towels and their amazing body cremes layered with their beautifully light fragrances to create a signature scent all your own. If you're like me, it'd be the perfect way to perk up your hands after carrying all those shopping bags! Miranda of Slashed Beauty was lucky enough to get a demonstration! 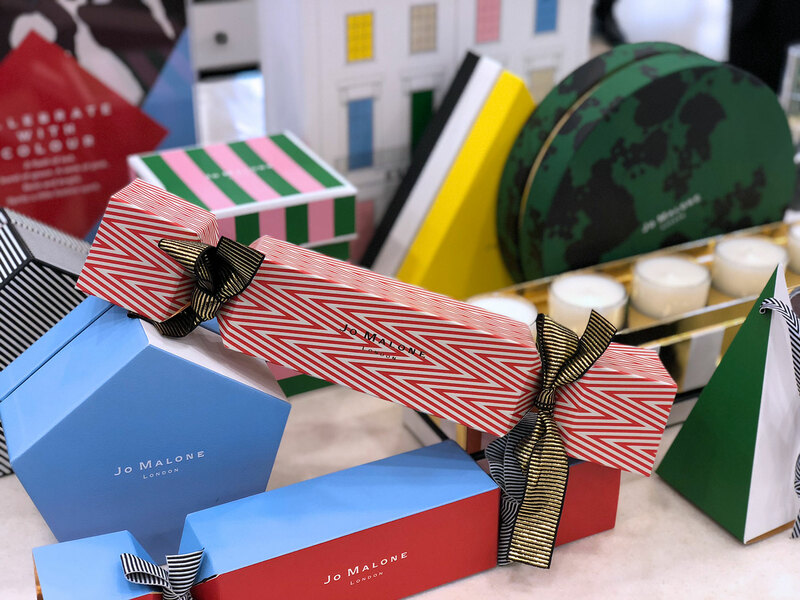 Jo Malone made gift-giving super easy this year, their gift sets are so fun and colorful! 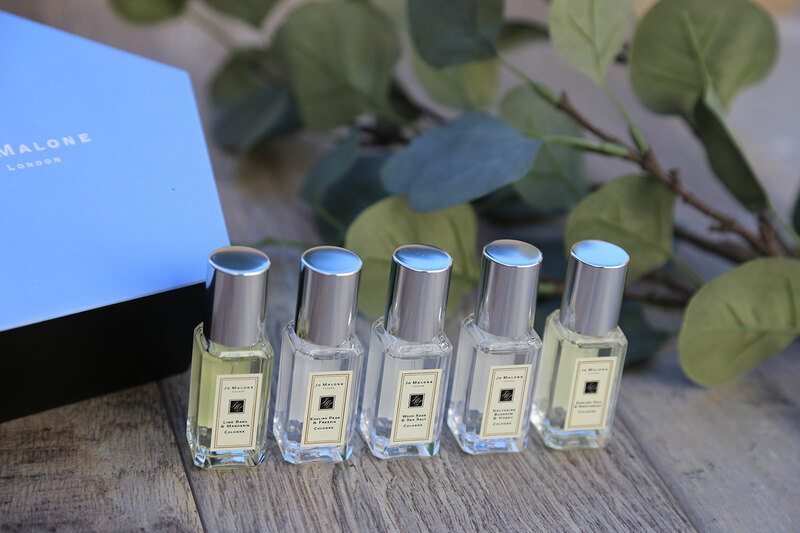 I had to snag one of the gift sets for myself–I purchased the Cologne Collection, which contains five .3 fl oz. bottles of 5 of their popular scents: Lime Basil & Mandarin (their first scent! ), English Pear & Freesia (it smells like champagne! ), Nectarine Blossom & Honey, Wood Sage & Sea Salt, and English Oak & Red Currant. This set retails for $115, but you can make so many combinations of scents that it's totally worth it! I'm a fragrance nut, so I was stoked to pick this one up so I can 'play' a bit with their scents. They were also super kind and gifted us each a Bath Oil, which I'm so excited to use- my skin gets so dry here during winter due to the super dry air and my affinity for taking skin-searing showers. The scent I got is Grapefruit, which is so clean and citrusy - and the wearer is perceived as 10 years younger once people catch a whiff of those grapefruit notes! I love food. It sounds cliche, but one of the easiest ways to my heart is through my stomach. 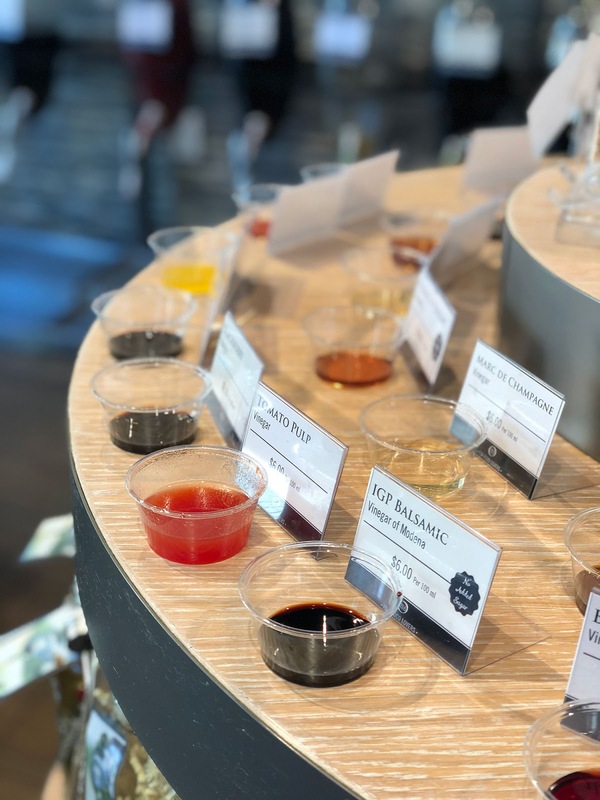 Oil & Vinegar was like a wonderland for me– all sorts of oils & vinegars, as the name would suggest, but they don't stop there. 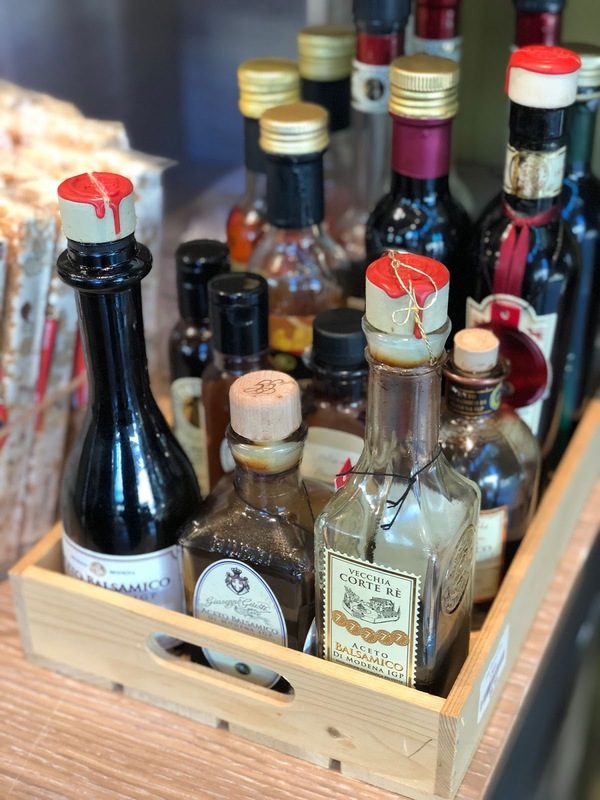 There are tons of great foodie gifts at this store, from imported bottles of Balsamic Vinegar to spicy mustards and herb mixtures. I actually super surprised myself and picked up the Devil's Mustard, a tangy, yet spicy mustard. Why is that surprising? Well...because I. HATE. MUSTARD. 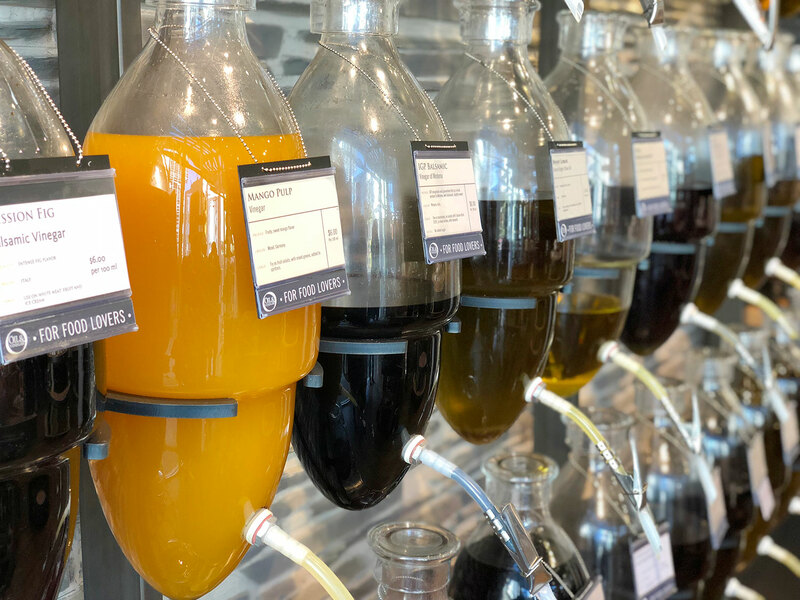 The cool things about this shop is that the oils and vinegars are literally on tap! 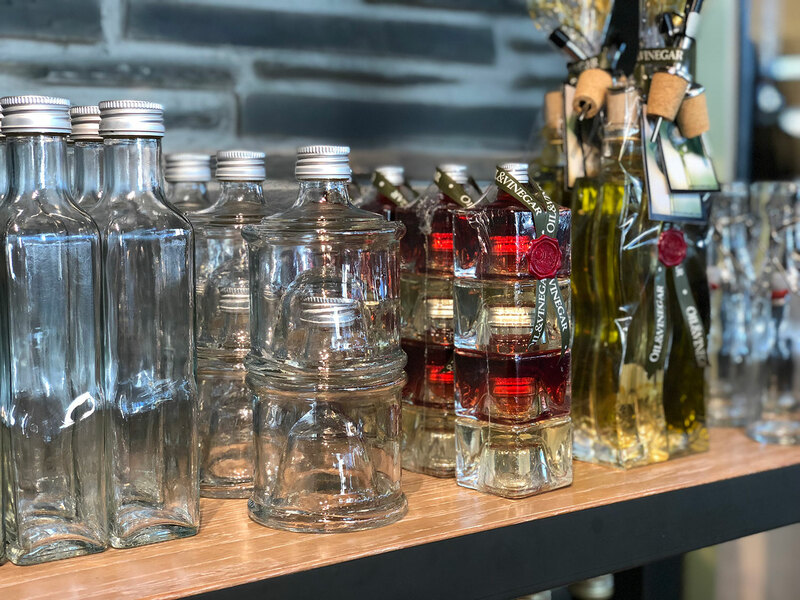 You choose your bottle (or bring your own, but the volume must be clearly marked), and then a member of their staff will fill it up for you and label it with a hangtag. How do you know what kind of oil or vinegar you want when there are literally dozens to choose from? Well, you taste them, of course! They have samples of each of their offerings so you know exactly what you're getting. They have classics like garlic oil, which I got, all the way to the unique flavors like chocolate! One rad idea they had was to replace the oil in a boxed cake or brownie mix with one of the flavored oils like Blood Orange. Totally makes you look like a culinary genius! Looking for leather? 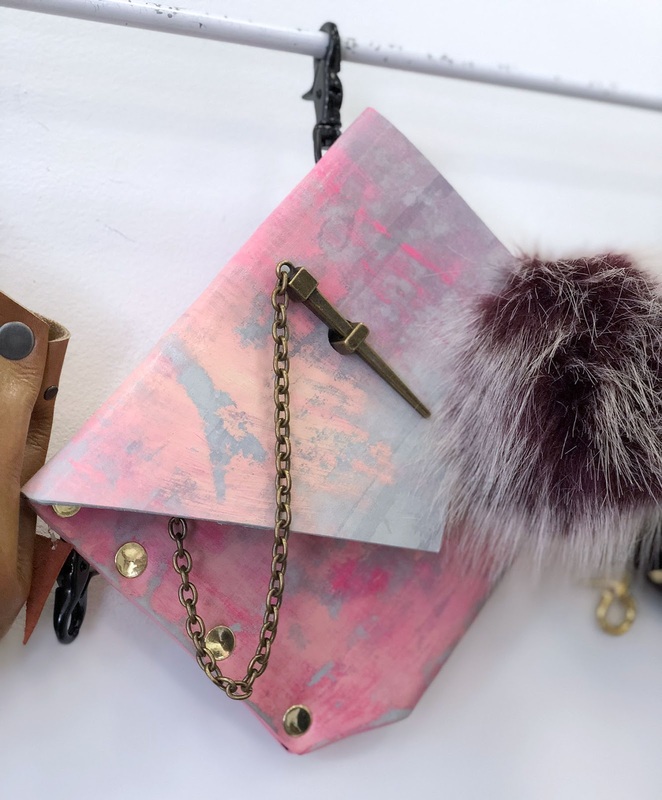 This super chic boutique carries all things leather and fab! They actually made COOL fanny packs - I'm kind of in love with the hand-painted leather one above, isn't it rad?! 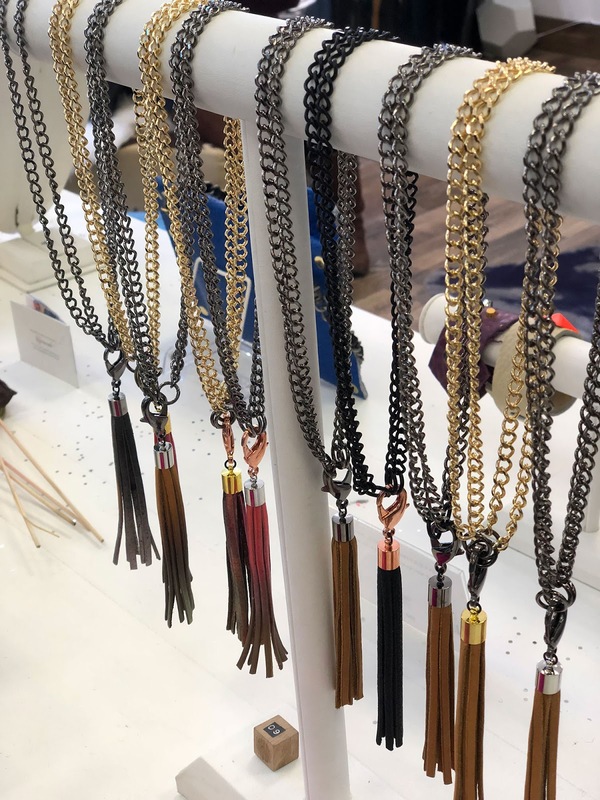 They also have cool necklaces, purses, clutches, bracelets, luggage tags...name it! The best part is that it is all made by the designer, Jessica Galindo! One of my favorite things is that no leather goes to waste. 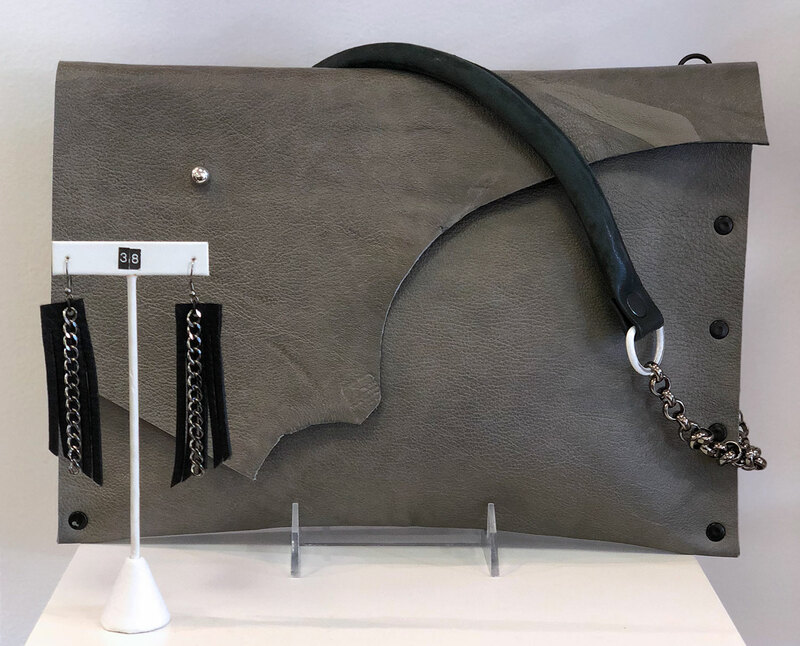 They turn scraps into rings, earrings, even accents for their shopping bags that you can repurpose as simple leather bracelets! I bought two of the handmade rings, I love how simple and unique they are. I'm no stranger to West Elm - most of the furniture in our house, not to mention our window treatments, are all from West Elm. I love the small design items that you can grab to add a little something to your home. I was super excited to stop here to see what new stuff they were up to! I can always trust West Elm to have tons of stuff I want, no, NEED! 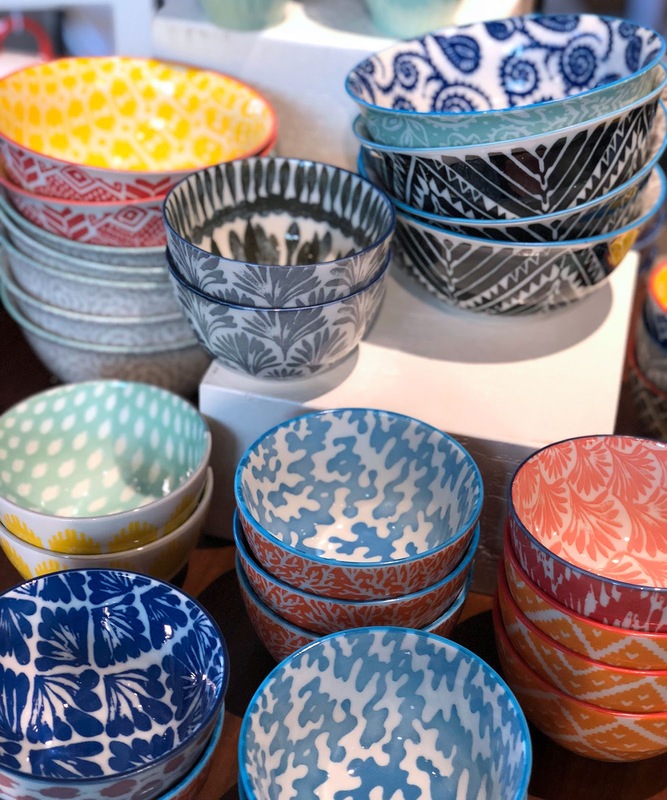 From colorful bowls to stylish wooden desks, they've got such a great range of gift-giving ideas! I wonder if Santa gets facials? If he did, this would be a great spot to remedy some of the stress of holiday shopping with a nice facial, or maybe a mani/pedi?! Sounds good to me-sign me up! Would you believe that I have NEVER had a facial?! While we were there, we were offered one of their tea mixtures, which, despite having no sugar had a touch of sweetness to it, thanks to the licorice. 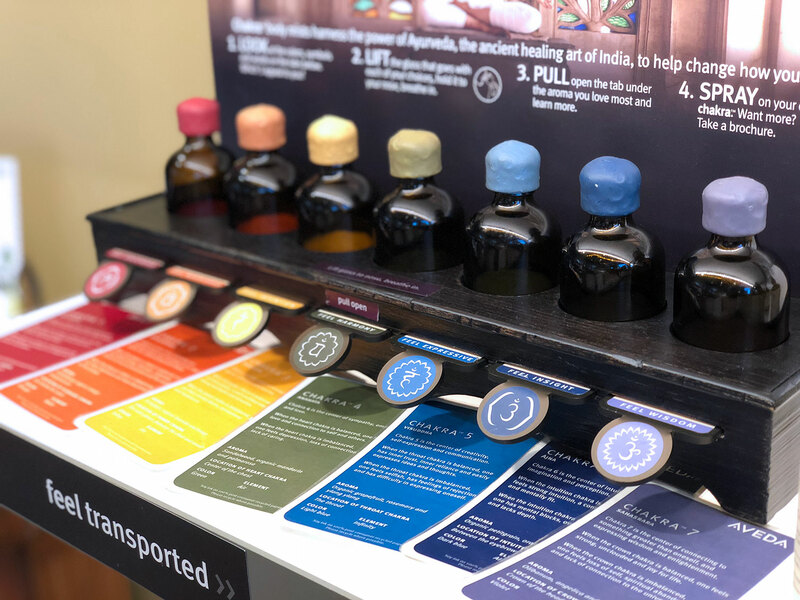 While we sipped, we learned about the essential oils that they sell - I particularly liked the one from the men's line, but I tend to lean toward more masculine scents. Another cool thing I saw there were the Chakra oils. Basically you choose what you want to feel, like Harmony, Expressiveness, Insight, or Wisdom, and you lift the glass dome that corresponds and inhale. You can then read the card that corresponds to learn a bit more about that chakra point! Food again. You guys should know me by now...I could eat nonstop if I was allowed. One of my food vices? Pizza. Duh. I've always said that if I had to choose one food to eat for the rest of my life, I'd choose pizza every time. I mean think about it, you can literally have ANY kind of pizza - BLT pizza, pepperoni pizza, veggie pizza, basically anything that your little heart desires, but I digress. 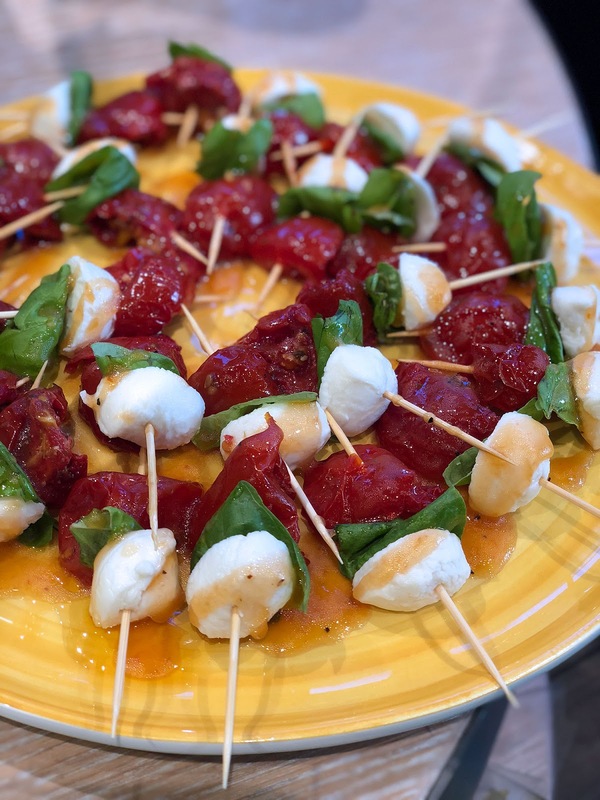 Our last stop was at CPK to try out all the deliciousness they have to offer! 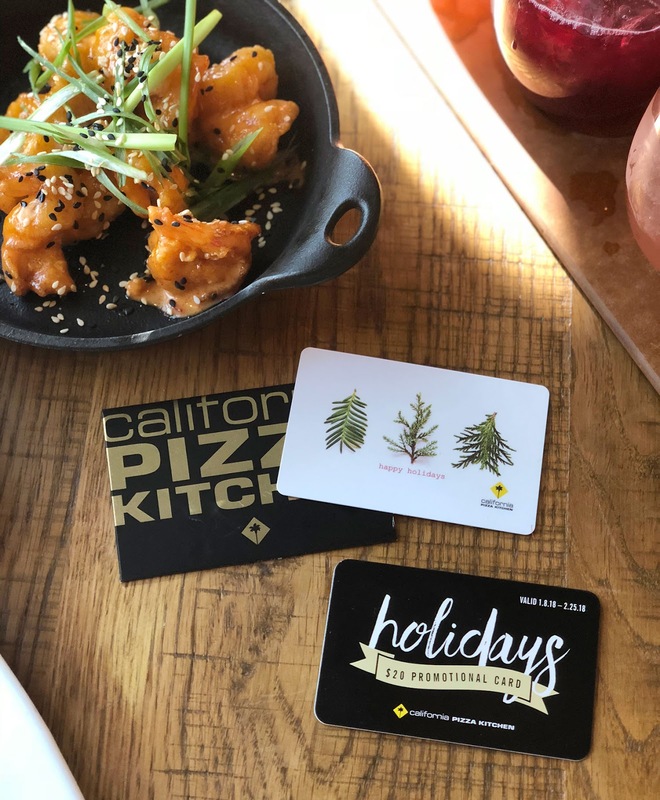 Also - did you know that right now (through Jan 1), when you purchase $100 in gift cards (in any mixture of denominations), you get an additional bonus gift card for you valued at $20! Talk about win/win. We started off with drinks, (naturally! ), and tried out their Sangria flight. Since they were sugary drinks, I could only have a sip of each, but they were delish! 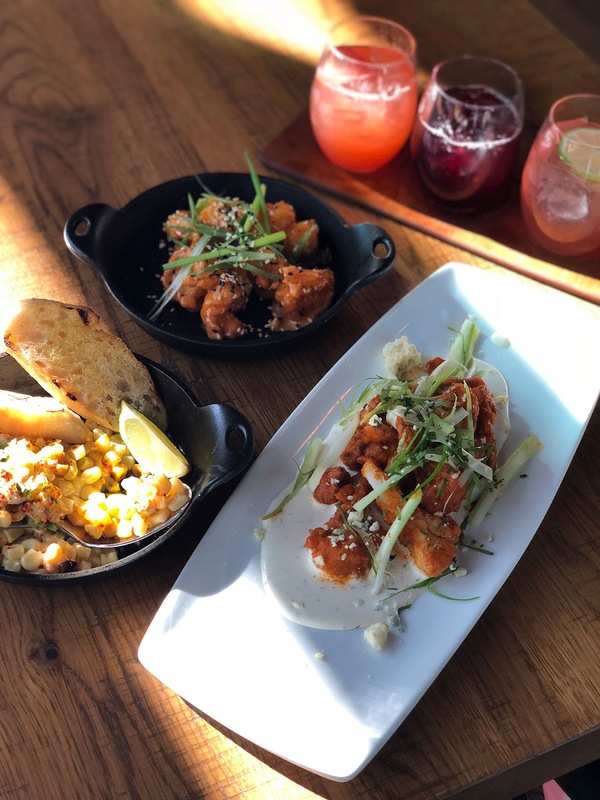 Following that were the apps, Spicy Buffalo Cauliflower with heat that snuck up on you, the Dynamite Shrimp, which I devoured and I don't usually like shrimp! Last of the appetizers was my favorite, the Mexican Street Corn...so yummy. Next stop...pizzzzza town!!!! (always my favorite stop!) 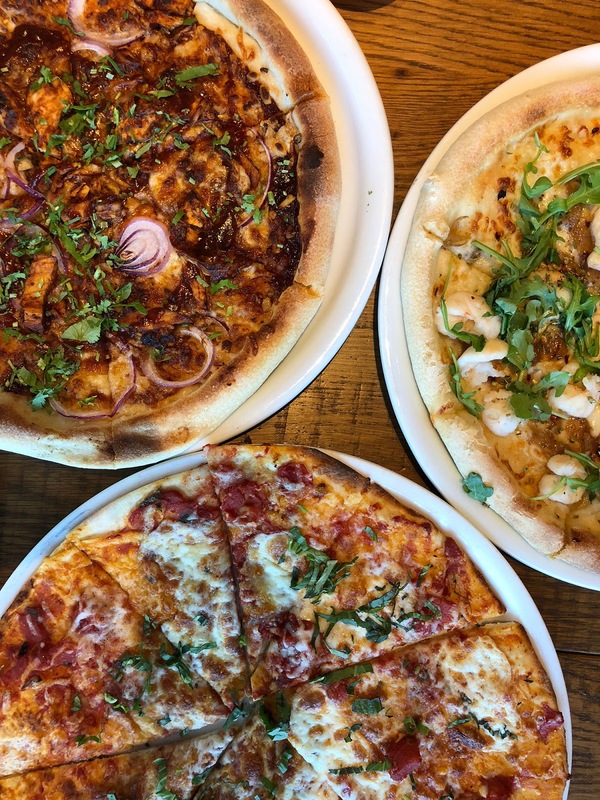 We got to sample a few of their top favorites, the Margherita, the Original BBQ Chicken Pizza, and the Shrimp Scampi, which packed some serious punch in the way of red chili flakes. My mouth was en fuego! 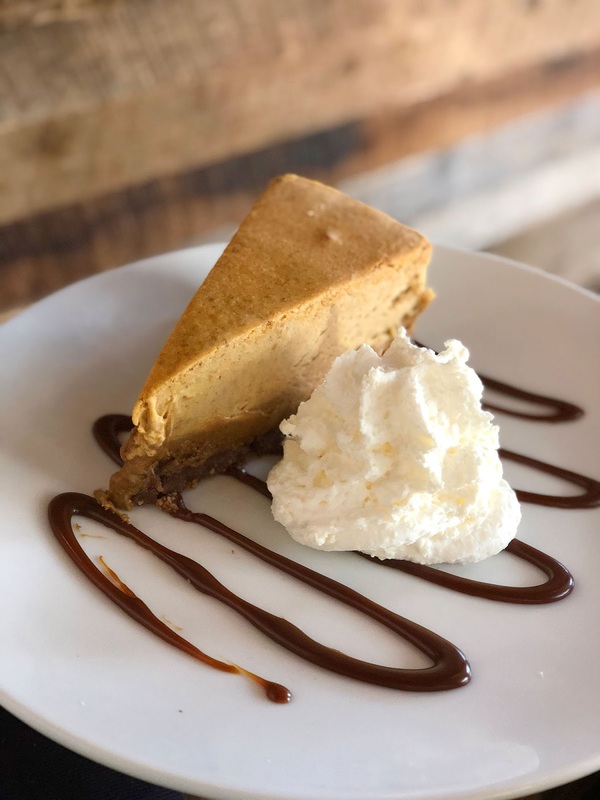 We rounded out our meal with some seasonally appropriate Pumpkin Cheesecake, which duh, was so yummy! :D Is bad cheesecake even possible? Doubtful. What do you think? Will you be headed to Downtown Summerlin soon? 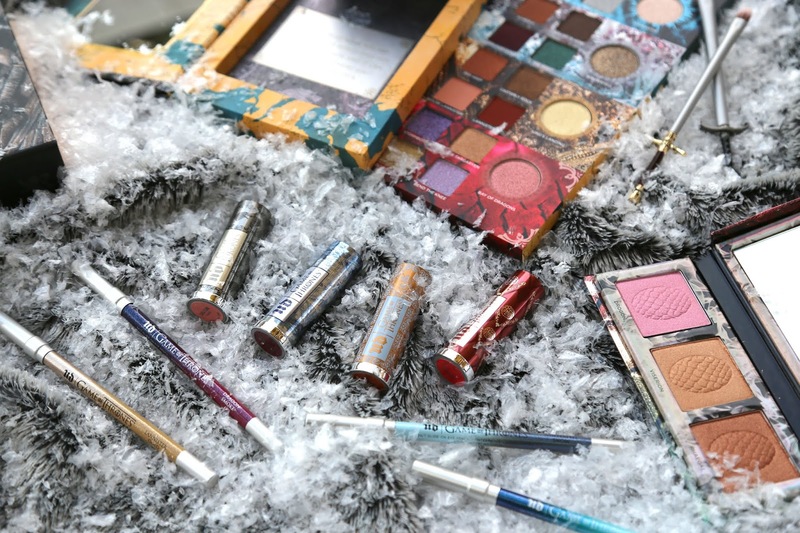 The holidays are here, so now's the time to get all your shopping finished up! 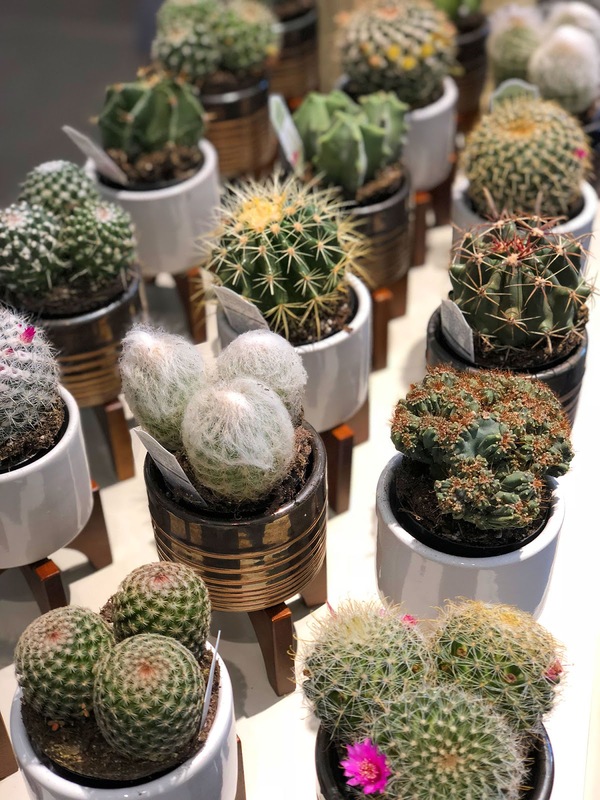 Keep an eye on my Instagram for more great gift ideas from other Downtown Summerlin shops! Are You Ready for the Glam Finale? !